Junior Emily Hutcherson drives to the basket against the Raiders Thursday night as the Indians would fall 46-35 to Frontenac. Following their last matchup, the St. Paul Lady Indians narrowly escaped a tenacious Blu-Jays team, 46-38. Thursday, Jan. 31, St. Paul (11-2) stayed on their home court as they faced the Frontenac Raiders (4-8) in a nonconference matchup. 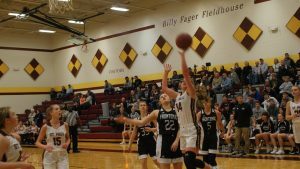 In the first quarter, the Raiders full-court pressure defense became troublesome for the Lady Indians as St. Paul could not get anything going offensively. Frontenac doubled, as well as triple-teamed junior Katie Coomes with inside looks just not there for the Indians. The offense started to pick up in the second as St. Paul slowly started to creep their way back into the game. But with 13 turnovers in the first half, the Indians trailed the Raiders 19-10. The Raiders then switched to a zone defense following the second half which in return helped the Indians get better shots. But with the aggressive, hawking defense of the Raiders, St. Paul struggled to find their way back into the game. Junior Taylor Wiatrak made a strong effort in the second half for the Lady Indians scoring 10 points in the second half. Wiatrak’s efforts weren’t quite enough though as the Raiders (5-8) went on to hold off the Indians (11-3) 46-35. The junior Wiatrak led the game in scoring for the Indians Thursday night with 15 points total. Junior Emily Hutcherson gave a strong effort as well finishing her night with 6 points. For the boys, they come off a tough 41-27 loss to the Pleasanton Blu-Jays Tuesday, Jan. 29. As the St. Paul boys (6-7) looked to find momentum, they faced CNC team the Frontenac Raiders (5-8) in a non-conference battle. Much like the girls’ game, Frontenac became quick to apply the full-court pressure as the Indians struggled to find the basket early. With Frontenac’s size advantage, the Raiders were able to get looks inside. Frontenac’s aggressive inside attack and smothering defense would push the Raiders lead to double-digits at halftime, 36-22. From there, the Raiders’ (6-8) lead became too much for the Indians to make a comeback effort as Frontenac went on to win 60-38 over the Indians (6-8). Junior Adam Albertini lead the game in scoring for the Indians with 12 points on the night. Junior Chase Bradshaw followed right behind scoring 11 points Thursday night for St. Paul. The Indians will travel to Jayhawk Linn for their next game Tuesday, Jan. 5 as both teams will look to bounce back from their losses.